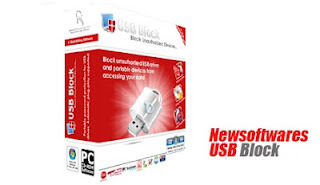 Block Network Access: USB Block lets you block PC in My Network Places, Specific PC's drives in My Network Places, Map Network drives, Ethernet, Wi-Fi and Bluetooth Networks or any other drive that user access via Run command, IP, DOS or Windows Explorer. Safe Mode Protection: You don't have to worry about your data security when your computer is working in Safe Mode because USB Block's protection also works in Safe Mode. Unauthorized devices will remain blocked while the devices in your Authorize List will get full access to your computer. Authorize List Option: The program offers you an option by which you can add your own storage devices to your Authorize List. Once a device is added to your Authorize List, it will get full access to your computer as soon as it plug-in to your computer without prompting you to enter password. If you want to remove a device from this list, go to 'Authorized Devices' tab, select the device and click 'Remove from List'. Lightweight. Secure. Easy To Operate: USB Block is unique in task automation and allows you to set task specific entries according to your own requirements. It is a lightweight and an easy-to-use program that does not bother you while you are working toward achieving productivity.